We ship worldwide! Please don't hesitate to contact us with your shipping questions. We have the best shipping rates on the internet for Ipe Decking. We deliver to your home or jobsite with our own trucks. How to Set Up Ipe Decking After Delivery? 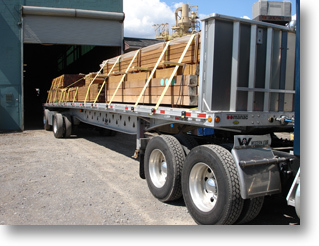 When your Ipe Decking arrives, the unloading process ensures each board is up to the highest standards. Watch the video above for a step-by-step explanation. Above: One of our delivery trucks loading for deliveries of decking across the United States. We own and operate our own trucks in order to offer you the best prices, and on time delivery. We also utilize several common carriers to give you the best freight rate possible. Shipping and Ordering Information: Please call, e-mail or FAX us with your orders. We will call you to verify your order and to make payment arrangements. We ship large orders with our own trucks and drivers, across the US and Canada. We also have several other trucking companies that work with us at up to a 85% discount which we pass onto you. Orders can be shipped direct to your doorstep, or can be held at your local terminal for customer pickup. Small orders are shipped via UPS. We also ship to European and other foreign countries on container load basis. We ship anywhere in the world...please phone or email if you have freight questions. Note: If needed we can deliver with smaller length trucks. Saturday delivery is also available for many areas of the US. Northeast States: 1 to 2 day delivery. 1. Place a order with us by fax or phone. Let us know if you have a special delivery situation where a 48' tractor trailer can not make it down your street. We can offer other options. 2. 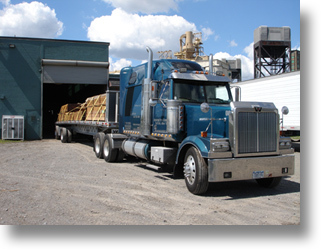 The shipping company or one of our truck drivers will call customer and set up delivery time prior to delivery. 3. Delivery truck will arrive at your location. 4. Unloading is typically done by hand. The truck driver will hand the boards down from the truck. The customer is required to be on the ground to set the boards in a pile. Example: A $5,000.00 order is typically a 20 to 30 minute unload. 5. In the rare instance that any boards where damaged in transit then: sign the bill of lading "received damaged" and phone us within 24 hours. We will ship replacement boards to you on a rush status. In most parts of the country this is a 1 to 3 day turn around. Due to the extremely dense nature of the product the possibility of damaged boards is very rare. © 2002 - AdvantageLumber.com® - All rights reserved.